The Airtronics M11X 4-Channel 2.4GHz FHSS-3 is the top-of-the-line ROAR NATIONAL CHAMPION competition surface radio that serious racers demand and the sportsman desires. Based on the legacy M8 and M11 radios that have won multiple awards, the M11X continues with the tradition offering the best radio with the most current features all users can appreciate. The M11X is lighter than previous models, faster than any wheel radio we've tested, and has additional features and numerous adjustments beyond even that of the original M11. And yet, its new layout makes using those features easier than ever before. From a custom menu where you can put your favorite features on one screen to multiple failsafe settings to optimize this feature for nitro or electric, the new M11X is amazingly powerful and easy to use. With extended race times and events, the weight of the transmitter is more important than ever. The newly-designed, more-efficient, dedicated 2.4GHz RF system, along with the smaller and lighter transmitter battery work together to make the M11X lighter and easy to handle. Adding to the comfort, the M11X has a more traditional balanced feel and improved ergonomics. For professionals, nothing matters more than speed and reliability. 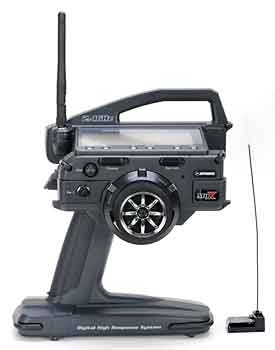 The M11X is lightning fast, thanks to the 2.4GHz system integrated into the radio circuitry in addition to using the latest FHSS-3 2.4GHz technology. This feature alone makes the radio inputs feel instantaneous! Lastly, while the legacy M11 had numerous adjustments, the M11X takes it one step further. We worked closely with our world-championship drivers, both boat and car, and we listened to them. The M11X has the added features needed for an ever-changing and expanding hobby. *The M11X's 4th channel is not an independent channel. It is used as a 4th-channel brake that can be mixed with the channel 2 and/or channel 3 brake.